Where Is This Old House? Are you up for another challenge? 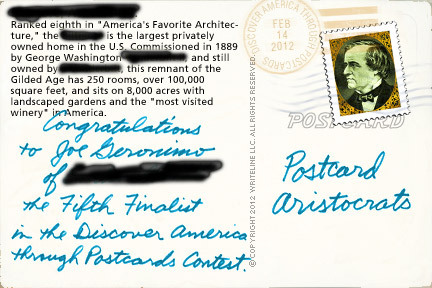 Below, you'll see the postcard and a photo caption, as usual, but any reference to the place is blacked out so you can guess where in America it might be. To get the answer, just click on the card or the link at the end of the description. 9th Annual -- Fifth week's Finalist. 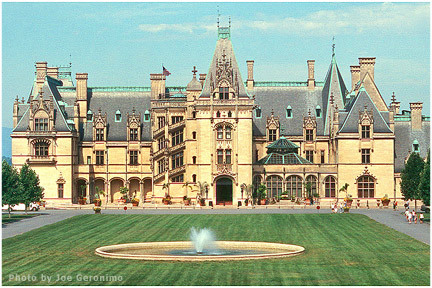 Ranked eighth in "America's Favorite Architecture," the ------------ is the largest privately owned home in the U.S. Commissioned in 1889 by George Washington -------------, and still owned by ----------------, this remnant of the Gilded Age has 250 rooms, over 100,000 square feet, and sits on 8,000 acres with landscaped gardens and the "most visited winery" in America. Think you know where it is? Find out where this old house is.